Thanks to MyBlogSpark, my family recently had the chance to try out the Yoplait brand of Greek Yogurt. We tried out both the Strawberry and Blueberry flavors. The consistency is thick and creamy and does not contain large fruit chunks. The taste is a little more tangy than normal yogurt and slightly chalky. I liked the Strawberry flavor more than the Blueberry. Neither my daughter or husband particularly liked the Greek blend, but my toddler son ate his entire cup of Greek yogurt right up! While I'm not sure that I'll switch to eating Greek yogurt over my normal yogurt, I especially like that, according to the label, it contains 2x the amount of protein of the leading yogurt. I'll probably pick a few more containers up from the store again if I need a filling snack or protein-filled mealtime side dish. Yoplait Greek Yogurt comes in four different flavors: Strawberry, Blueberry, Plain and Honey Vanilla. Each Yoplait Greek serving contains 100-130 calories depending on the flavor and 0% fat. Yoplait wants you to "Nourish Your Inner Goddess" and has offered to giveaway a gift pack to a Brimful Curiosities reader. The "Nourish Your Inner Goddess" gift pack includes items to help you relax including a wrap robe and slippers and two coupons* for Yoplait Greek yogurt. *According to MyBlogSpark, the coupon for a free cup of Yoplait Greek yogurt is not valid in the following states: California, Idaho, Louisiana, Minnesota, Nevada, New Jersey, North Dakota, and Tennessee. • Contest ends on Wednesday, June 16th, 2010 at 11:59 PM CST. 1st extra entry: Visit Yoplait Greek and leave a comment with the name of the Yoplait Greek flavor that interests you the most. I want to try the honey! I am most interested in trying the Strawberry Yoplait Greek flavor. I've heard about this yogurt, but I feel like I won't really understand how it's different until I try it! I love greek yogurt and I would love to try the honey vanilla. Honey Vanilla Greek Yogurt sounds really good to me! What I really like about yogurt is that it gets your digestive system back on track. I suffer from IBS, and this really helps. I'd like to try this new yogurt and the robe and slippers look relaxing. Thanks. I'd most like to try blueberry. 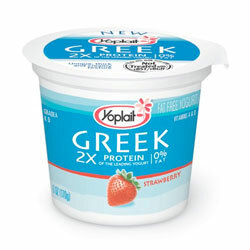 Would love to try Yoplait Greek yogurt! Fabulous package! Please count me in! Yogurt is a staple at our house too. I would love to try this, especially since it has more protein than others. The Honey Vanilla sounds yummy! Strawberry is my favorite. Thanks for the giveaway! I've been curious to try this and I'd have Honey Vanilla first. I'd love to try the Honey Vanilla. Couldn't be a more perfect way to start the day but with comfy slippers and my favorite healthy yogurt-twice the protein! Strawberry is my favorite but I've lately been leaning towards blueberry! And having so few calories makes this yogurt even better! I like that it has double the protein of other yoghurts; it seems to fill you up quicker, and with fewer calories. I like blueberry. On this first extra entry, I will reiterate that I like blueberry the most. Thanks. I can't wait to try the strawberry. Yogurt is so yummy. We love it! I think of all the flavors I would chose the blueberry. Like a yummy blueberry pie! I am now following via RSS Feed. My favorite Yoplait Greek yogurt flavor would be strawberry. Thanks - I think my inner goddess is hiding! Honey vanilla sounds good to me! I'm curious about a lot of things and learned long ago to ask questions. At this point in time I'm trying to gain some knowledge about mathematics. I think the Honey Vanilla sounds great (and if I want a little fresh fruit, I'll add my own). This is a great giveaway. I've never had greek yogurt and wonder how much different it is. I also forgot to add in my first post that Strawberry is our favorite! This looks so yummy and I'd love to try it! I'd love to try this yogurt! Thanks! Honey Vanilla sounds just absolutely divine! Great lux giveaway! I would love to try the Honey Vanilla. Thanks for the giveaway...we love the new Yoplait Greek Yogurt; would love to win this "Goddess" prize for my wife ! Honey Vanilla is #1 !!! my favorite flavor is the strawberry Greek yogurt. The strawberry Yoplait Greek Yogurt sounds really good. Thanks for having the contest! what a very relaxing and wonderful giveaway for this mother of 2 sets of twin boys! the blueberry flavour appeals to me! I'd like the Blueberry flavor. With the double protein, this type of yogurt would be a good choice after an exercise routine. I purchased the plain version and it is very delicious! I've wanted to try this yogurt since its debut, what a cool prize! I visited Yoplait Greek and their Honey Vanilla intersts me the most! Thanks for the giveaway. I really like yogurt. I haven't tried this but will get the bluberry flavor next time I go to market.They look very tasty. Bluberry interests me the most.